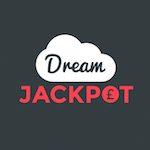 Get a second deposit bonus of 100% up to £150 and 50 Spins on Aloha Cluster at Dream Jackpot UK. Click the blue button in the description and make the necessary payment to receive your offer. This offer comes with a 35-times wagering requirement on the bonus plus the deposit amount. You can cash out a maximum of £50 from the spins. Claim this promotion and have lots of fun!